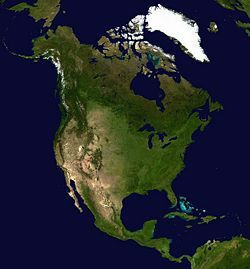 The Great Lakes of the Laurentian Shield are a group of five large lakes in North America on or near the Canada-United States border. They are the largest group of fresh water lakes on Earth. The Great Lakes-St. Lawrence system is the largest fresh-water system in the world, totaling over 94,000 square miles. Sometimes referred to as inland seas, it is estimated that they hold six quadrillion gallons of water; 90 percent of the U.S. supply and 20 percent of the world's supply. In addition to these lakes in themselves, there is a great and vital system of channels connecting them. Lakes Michigan and Huron, being hydrologically intertwined, are sometimes considered to be one entity: Lake Michigan-Huron. Considered together, Michigan-Huron would be larger in surface area than Lake Superior, but smaller in total water volume. The system also includes the rivers that connect the lakes: St. Marys River between Lake Superior and Lake Huron, the Saint Clair River between Lake Huron and Lake Saint Clair, the Detroit River between Lake St. Clair and Lake Erie, and the Niagara River and Niagara Falls, between Lake Erie and Lake Ontario. Lake Michigan is connected to Lake Huron through the Straits of Mackinac. Large islands and a peninsula divide Lake Huron into the lake proper and Georgian Bay. The lakes are bounded by Ontario (all of the lakes except Michigan), Minnesota, Wisconsin, Michigan (all but Lake Ontario), Illinois, Indiana, Ohio, Pennsylvania, and New York. 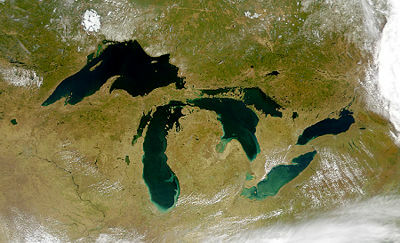 Four of the five lakes straddle the U.S.-Canada border; the fifth, Lake Michigan, is entirely within the United States. The Saint Lawrence River, the international border for part of its course, is a primary outlet of these interconnected lakes, and flows through Quebec and past the Gaspé Peninsula to the northern Atlantic Ocean. Sprinkled throughout the lakes are the approximately 35,000 Great Lakes islands, including Manitoulin Island in Lake Huron, the largest island in any inland body of water (also home to the world's largest lake within a lake: Lake Manitou), and Isle Royale in Lake Superior, the largest island in the largest lake (each island large enough to itself contain multiple lakes). Today, 20 percent of the world’s fresh surface water is contained in the five great lakes: 5,472 cubic miles (22,812 km³), or six quadrillion U.S. gallons (22.81 quadrillion liters) in all. It is enough water to cover the contiguous 48 states to a uniform depth of 9.5 feet (2.9 m). The combined surface area of the lakes is 94,250 square miles (244,100 km²)—larger than the states of New York, New Jersey, Connecticut, Rhode Island, Massachusetts, Vermont and New Hampshire combined or the provinces of Prince Edward Island and Newfoundland and Labrador combined. The Great Lakes' coast measures 10,900 miles (17,549 km) (including islands and connecting channels), nearly as long as the total US ocean coastline (12,383 miles or 19,928 km), including Alaska. The Saint Lawrence Seaway and Great Lakes Waterway connect the Great Lakes to ocean-going vessels. However, the trend to wider ocean-going container ships—which do not fit through the locks on these routes—has limited shipping on the lakes. Despite their vast size, large sections of the Great Lakes freeze over in winter, and most shipping halts during that season. Some icebreakers operate on the lakes. The lakes affect weather in the region, a phenomenon known as lake effect. In winter, the moisture picked up by the prevailing winds from the west can produce very heavy snowfall, especially along eastern lakeshores in Michigan, Ohio, Pennsylvania, Ontario, and New York. It is not uncommon for heavy snow to occur during completely clear skies because of this phenomenon. The lakes also moderate seasonal temperatures somewhat, by absorbing heat and cooling the air in summer, then slowly radiating that heat in autumn. This temperature buffering produces areas known as "fruit belts," where fruit typically grown farther south can be produced in commercial quantities. The eastern shore of Lake Michigan and the southern shore of Lake Erie are home to many wineries also as a result of this, as is the Niagara Peninsula between Lake Erie and Lake Ontario. A similar phenomenon occurs in the Finger Lakes region of New York in the form of fog, particularly along the shorelines of those lakes. This is most noticeable along Lake Superior's shores, due to its maritime climate. The Great Lakes have been known to strengthen storms, such as Hurricane Hazel in 1954, and a frontal system in 2007 that spawned a few tornadoes in Michigan and Ontario, picking up the warmth and energy from the lakes to fuel them. In 1996, a rare subtropical cyclone formed in Lake Huron, dubbed the 1996 Lake Huron cyclone. The Great Lakes were formed at the end of the last ice age about 10,000 years ago, when the Laurentide ice sheet receded. When this happened, the glaciers left behind a large amount of meltwater which filled up the basins that the glaciers had carved, thus creating the Great Lakes as we know them today. Because of the uneven nature of glacier erosion, some higher hills became Great Lakes islands. The Niagara Escarpment follows the contour of the Great Lakes between New York and Wisconsin – Herbert Simon called this escarpment "the spinal cord of my native land." The lakes are extensively used for transport, though cargo traffic has decreased considerably in recent years. The Great Lakes Waterway makes each of the lakes accessible. During settlement, the Great Lakes and its rivers were the only practical means of moving people and freight. Anything and everything floated on the lakes. Some ended up on the bottom because of storms, fires, collisions and underwater hazards. Barges from middle North America were able to reach the Atlantic Ocean from the Great Lakes when the Erie Canal opened in 1825. By 1848, with the opening of the Illinois and Michigan Canal at Chicago, direct access to the Mississippi River was possible from the lakes. With these two canals an all-inland water route was created between New York City and New Orleans. The main business of many of the passenger lines in the 1800s was transporting immigrants. Many of the larger cities owe their existence to their positions on the lakes as a freight destination as well as for being a magnet for immigrants. These immigration routes still have an effect today. Immigrants often formed their own communities and some areas have a pronounced ethnicity, predominantly Dutch, German, Polish, Finnish, among others. Since general freight these days is transported by railroads and trucks, domestic ships mostly move bulk cargoes, like iron ore and its derivatives, coal, and limestone for the steel industry. The domestic bulk freight developed because of the nearby mines. It was more economical to transport the raw materials for steel to centralized plants rather than forge steel at the mine sites. Components for steel, however, are not the only bulk shipments; grain exports are also a major shipping commodity on the lakes. In the nineteenth and early twentieth centuries, iron and other ores such as copper were shipped south on (downbound ships) and supplies, food staples, and coal were shipped north (upbound). Because of the location of the coal fields in Pennsylvania and West Virginia, and the general northeast track of the Appalachian Mountains, railroads naturally developed shipping routes that went due north to ports such as Erie, Pennsylvania and Ashtabula, Ohio. Because the lake maritime community developed largely independently, it has its own language. Ships, no matter the size, are referred to as boats. When the sailing ships gave way to steamships, they were called steamboats—the same term used on the Mississippi. The ships also have a distinctive design. Ships that primarily trade on the lakes are known as lakers. Ocean-going vessels are known as salties. One of the more common sights on the lakes is the 1,000 by 305 foot (105 by 32 meter), 60,000 US long tons (61,000 metric metric tons) self-unloader. This is a laker with a huge conveyor belt system that can unload itself by swinging a crane over the side. Today, the Great Lakes fleet is much smaller in numbers than it once was because of the increased use of overland freight and the use of larger ships replacing the need for many smaller ships. The Great Lakes have been used as a major mode of transport for bulk goods starting in 1697 with the brigantine Le Griffon. Commissioned by René Robert Cavelier, Sieur de La Salle, the ship was built at Cayuga Creek, near the southern end of the Niagara River and became the first sailing ship to travel the upper Great Lakes. In 2002, 162 million net tons of dry bulk cargo were moved on the Lakes. This was, in order of volume: iron ore, coal, stone, grain, salt, cement, and potash. The iron ore and much of the stone and coal are used in the steel industry. There is also some shipping of liquid and containerized cargo but most container ships are too wide to pass through the locks on the Saint Lawrence Seaway. The total amount of shipping on the lakes has been on a downward trend for several years. Recreational boating and tourism are major industries on the Great Lakes. A few small cruise ships operate on the Lakes including several sailing ships. Sport fishing, commercial fishing, and Native American fishing represent a US$4 billion a year industry with salmon, whitefish, smelt, lake trout, and walleye being major catches. The Great Lakes are used to supply drinking water to tens of millions of people in bordering areas. This valuable resource is collectively administered by the state and provincial governments bordering the lakes. Several ferries operate on the Great Lakes to carry passengers to various islands, including Isle Royale, Pelee Island, Mackinac Island, Beaver Island, both Bois Blanc Islands, Kelleys Island, South Bass Island, North Manitou Island, South Manitou Island, Harsens Island, Manitoulin Island, and the Toronto Islands. As of 2007, two car ferry services cross the Great Lakes, both on Lake Michigan: a steamer from Ludington, Michigan to Manitowoc, Wisconsin and a high speed catamaran from Milwaukee to Muskegon, Michigan. An international ferry crossing Lake Ontario from Rochester, New York to Toronto ran during 2004 and 2005, but is no longer in operation. Travel on the Lakes has been risky. Because of the immense size of the Lakes, there are vast stretches of open water without sight of land. The Lakes are sometimes referred to as inland seas. Many thousands of ships have sunk in these waters. Storms and unseen reefs are a frequent threat. An estimated 6,000 to 10,000 vessels have sunk or been stranded since the early 1800s, many with partial or total loss of crew. The Lakes are prone to sudden and severe storms, particularly in the autumn, from late October until early December. The Great Lakes Storm of 1913 is the worst storm on these waters on record: at least 12 ships sank, and 31 more were stranded on rocks and beaches. At least 248 sailors lost their lives over that weekend. The SS Edmund Fitzgerald, which sank November 10, 1975, was the last major freighter lost on the lakes, sinking almost 20 miles off Whitefish Point in Lake Superior with all 29 crew members lost. The greatest concentration of these wrecks lies near Thunder Bay (Michigan), in Lake Huron, near the point where eastbound and westbound shipping lanes converge. Today there is a U.S. NOAA Marine Archeology Research Station located in the Thunder Bay National Marine Sanctuary. Here divers can explore more than 200 shipwrecks that form one of the most concentrated and best preserved maritime archaeology sites in the world. For many years in the late 1700s and early 1800s, wars were fought over the control of the Lakes and many warships were built for the inland seas, ranging from small and swift sloops-of-war to three-deckers capable of standing in any line of battle. The Rush-Bagot Agreement of 1817 limits the number of armed vessels permitted on the Great Lakes. The International Joint Commission was established in 1909 to help prevent and resolve disputes relating to the use and quality of boundary waters, and to advise Canada and the United States on questions related to water resources. Concerns over diversion of Great Lakes' water are of concern to both Americans and Canadians. Some water is diverted through the Chicago River to operate the Illinois Waterway but the flow is limited by treaty. Possible schemes for bottled water plants and diversion to dry regions of the continent raise concerns. Under the US Water Resources Development Act  diversion of water from the Great Lakes basin requires the approval of all eight Great Lakes governors, which rarely occurs. International treaties regulate large diversions. In 1998, the Canadian company Nova Group won approval from the Province of Ontario to withdraw 158,000,000 US gallons (600,000 m³) of Lake Superior water annually to ship by tanker to Asian countries. Public outcry forced the company to abandon the plan before it began. 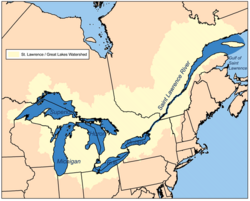 Since that time, the eight Great Lakes Governors and the Premiers of Ontario and Quebec have negotiated the Great Lakes-St. Lawrence River Basin Sustainable Water Resources Agreement and the Great Lakes-St. Lawrence River Basin Water Resources Compact that would prevent most future diversion proposals and all long-distance ones. The agreements also strengthen protection against abusive water withdrawal practices within the Great Lakes basin. On December 13, 2005, the Governors and Premiers signed these two agreements: the first is between all ten jurisdictions. It is somewhat more detailed and protective, but cannot be enforced in court because enforcement arrangements can be made only between the federal governments. The second is exclusively among the U.S. states, which, if approved by all eight state legislatures that border the Great Lakes and the U.S. Congress, could be enforced in U.S. federal court. A preliminary health risk assessment stated that the “proposed training will result in no elevated risks for a freshwater system such as the Great Lakes … or generic marine environments using ‘realistic worst case’ assumptions, and further investigation is not recommended. If typical rather than worst case assumptions were used the predicted risk would be even less.” This assessment is based on lead levels after five years which are only one-third of those allowed by the U.S. EPA. After 15 years, one could infer that lead levels could meet or exceed EPA safe levels for lead. A Coast Guard information page has been established to keep the public abreast of developments. Stop the introduction and spread of aquatic invasive species by enacting a comprehensive national program. Prevent the Asian carp from entering the Great Lakes by authorizing the Corps of Engineers to maintain and operate the dispersal barrier on the Chicago Sanitary and Ship Canal, and prohibit the importation and sale of Asian carp. Restore fish and wildlife habitat by reauthorizing the Great Lakes Fish & Wildlife Restoration Act at $20 million. Prevent sewage contamination by reauthorizing the State Revolving Loan Fund and provide $20 billion over five years to assist communities nationally with improving their wastewater infrastructure. Clean up contaminated sediment under the Great Lakes Legacy Act by authorizing $150 million per year. Phase out mercury in products by establishing a new grant program and improving existing research programs. Coordinate and improve Great Lakes programs by establishing the Great Lakes Interagency Task Force and the Great Lakes Regional Collaboration process. The Healing Our Waters - Great Lakes Coalition has formed to help groups and citizens across the United States advocate for restoring the health of the Great Lakes. Lake Champlain, on the border between upstate New York and northwestern Vermont, briefly became labeled by the U.S. government as the sixth "Great Lake of the United States" on March 6, 1998 when President Clinton signed Senate Bill 927. This bill, which reauthorized the National Sea Grant Program, contained a line by Senator Patrick Leahy (D-VT) declaring Lake Champlain to be a Great Lake. Not coincidentally, this status allows neighboring states to apply for additional federal research and education funds allocated to these national resources. The claim was viewed with some amusement by other countries, particularly in the Canadian media; the lake is small compared to other Canadian lakes (such as Great Bear Lake with over 27 times more surface area). Following a small uproar (and several New York Times articles), the Great Lake status was rescinded on soon afterwards, although Vermont universities continue to receive funds to monitor and study the lake. Similarly, there has been interest in making Lake St. Clair a Great Lake. 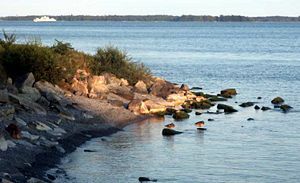 In October, 2002, backers planned to present such a proposal at the Great Lakes Commission annual meeting, but ultimately withheld it as it appeared to have little support. A more recent threat to Lake Michigan fisheries is viral hemorrhagic septicemia, an introduced pathogen that can survive up to 14 days in lake water, infecting any fish that come in contact with it. An electric fence has been set up across the mouth of the Chicago Sanitary and Ship Canal in order to keep several invasive species of Asian carp out of Lake Michigan. The carp have voracious appetites and feed upon native fish species. They can grow to 90 pounds (kg) and nearly four feet (12 m) long. The barrier is not in use at this time as issues of controlling the electric current in the canal are not yet resolved. Before the arrival of Europeans, the lakes provided fish to the native groups who lived near them. Early European settlers were astounded by both the variety and quantity of fish. Historically, fish populations were the early indicator of the condition of the Lakes, and have remained one of the key indicators even in our technological era of sophisticated analyses and measuring instruments. According to the bi-national (U.S. and Canadian) resource book, The Great Lakes: An Environmental Atlas and Resource Book, "the largest Great Lakes fish harvests were recorded in 1889 and 1899 at some 67,000 metric tons (147 million pounds)," though environmental impacts on the fish can be traced back nearly a century prior to those years. For example, by 1801, New York legislators found it necessary to pass regulations curtailing obstructions to the natural migrations of Atlantic salmon from Lake Erie into their spawning channels. In the early nineteenth century, Upper Canada’s government found it necessary to introduce similar legislation prohibiting the use of weirs and nets at the mouths of Lake Ontario’s tributaries. Other protective legislation was passed as well, but enforcement remained difficult. On both sides of the US-Canada border, the proliferation of dams and impoundments multiplied, necessitating more regulatory efforts. There was a marked decline in fish populations by the middle of the nineteenth century. The decline in salmon was recognized by Canadian officials and was reported as to have virtually disappeared by the end of the 1860s. The Wisconsin Fisheries Commission noted a reduction of roughly 25 percent in general fish harvests by 1875. Dams were preventing sturgeon spawning as well. Many Michigan rivers sport multiple dams that range from mere relics to those that seriously impact fish. The State's dam removal budget has been frozen in recent years. In the 1990s the state was removing one dam per year. Overfishing was cited as responsible for the decline of the population of various whitefish, an important food source with economic consequences. Between 1879 and 1899, reported whitefish harvests declined from some 24.3 million pounds (11 million kg) to just over nine million pounds (four million kg). Recorded sturgeon catches fell from 7.8 million pounds (1.5 million kg) in 1879 to 1.7 million pounds (770,000 kg) in 1899. Giant fresh water mussels were wiped out by early Great Lakes entrepreneurs. There were other factors contributing to the declines besides overfishing and the problems posed by dams and other obstructions. Logging in the region removed tree cover near stream channels which provide spawning grounds, and this affected necessary shade and temperature-moderating conditions. Removal of tree cover also destabilized soil, allowing it to be carried in greater quantity into the streambeds, and brought about more frequent flooding. Running cut logs down the Lakes’ tributary rivers stirred bottom sediments. In 1884, the New York Fish Commission determined that the dumping of sawmill waste (chips and sawdust) was impacting fish populations. According to the authoritative bi-national source The Great Lakes: An Environmental Atlas and Resource Book, "Only pockets remain of the once large commercial fishery." The influx of parasitic lamprey populations, after the development of the Erie Canal and the much later Welland Canal, led to the U.S. and Canadian governments attempting to work together – which proved a very complicated and troubled road. Unfortunately, despite the ever more sophisticated efforts to eliminate or minimize the lamprey populations, by the mid 1950s the lake trout populations of Lake Michigan and Lake Huron were reduced by about 99 percent, largely due to the lamprey's predation. The Great Lakes Fishery Commission was an outgrowth of the efforts to control the lamprey. Other ecological problems in the Lakes and their surroundings have stemmed from urban sprawl, sewage disposal, and toxic industrial effluent. These also affect aquatic food chains and fish populations. Some of these glaring problem areas attracted high-level publicity of Great Lakes' ecological troubles in the 1960s and 1970s. Evidence of chemical pollution in the Lakes and their tributaries now stretches back for decades. In the late 1960s, the recurrent phenomenon of stretches of the Cuyahoga River in Ohio catching fire from a combination of oil, chemicals, and combustible materials floating on the water’s surface caught the attention of a more environmentally aware public. Another aspect that caught popular attention was the “toxic blobs” (expanses of lake bed covered by various combinations of solvents, wood preservatives, coal tar, and metals) found in Lake Superior, the Saint Clair River, and other areas of the Great Lakes region. ↑ ODNR Division of Water. December 11, 2000. Federal Statute on Great Lakes Water Diversions, Retrieved August 25, 2007. ↑ Meg Jones. November 8, 2006. Coast Guard's live-fire proposal prompts lead debate, Milwaukee Journal Sentinel. Retrieved August 25, 2007. ↑ Deborah Weisberg. December 24, 2006. Fishing: Coast Guard reloads on firing range, Pittsburgh Post-Gazette. Retrieved August 25, 2007. ↑ CBC News. June 11, 2007. Invasive species threaten Great Lakes: report, Retrieved August 25, 2007. ↑ Great Lakes Commission. March 27, 2007. Great Lakes Aquatic Nuisance Species, Retrieved August 25, 2007. ↑ Stop Aquatic Hitchhikers. - Impacts, Retrieved August 25, 2007. ↑ U.S. Environmental Protection Agency. October 1999. Great Lakes Non-Indigenous Invasive Species, Retrieved August 25, 2007. ↑ Northwest Indiana Times. March 17, 2004. Corps of Engineers is going fishing, Retrieved August 25, 2007. ↑ USDA National Agricultural Library. August 17, 2007. Laws and Regulations, Retrieved August 25, 2007. Great Lakes. United States Environmental Protection Agency. Great Lakes. The Nature Conservancy. This page was last modified on 12 July 2017, at 23:18.